Because we like it, we had the egg salad and sprouts in a panini roll again.. Since we received a brisket in our Keller Crafted meat box, we had to find a recipe to cook it! Foodie Greg found Brisket With Cider and Butternut Squash. 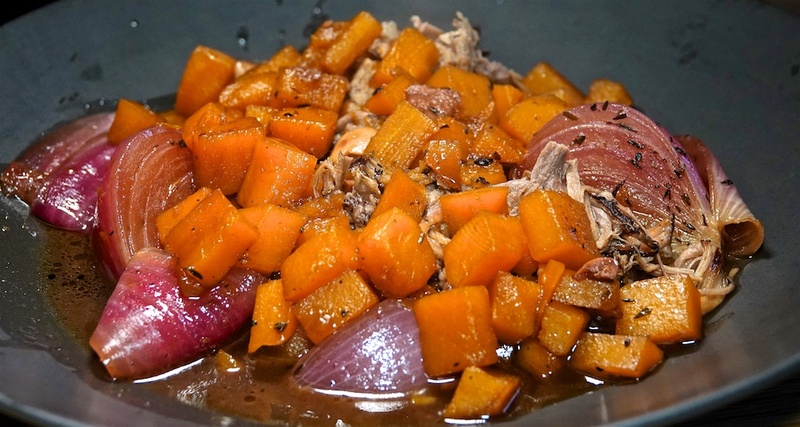 It’s a very slow cook, and we found the recipe a little sweet so Foodie Greg added a generous amount of apple cider vinegar to counter the sweetness. A really good brisket that we both really enjoyed for $7.99 per serve. Since we were nearby we decided on a Bahn Mi for lunch at $8.75 per serve. 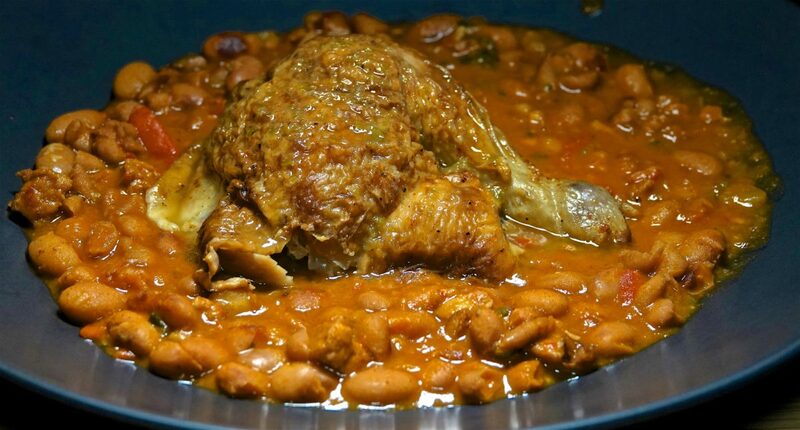 We finished the remaining Pinto Bean and Chorizo Sausage Stew (that had bene in the freezer while we were away) and topped it with a roast chicken leg from our Jon’s chicken. The Pino Bean and Chorizo stew is $2.10 per serve. A quick and easy meal for $3.85 that hit the spot. Two good half sandwiches for $3.13 per serve. 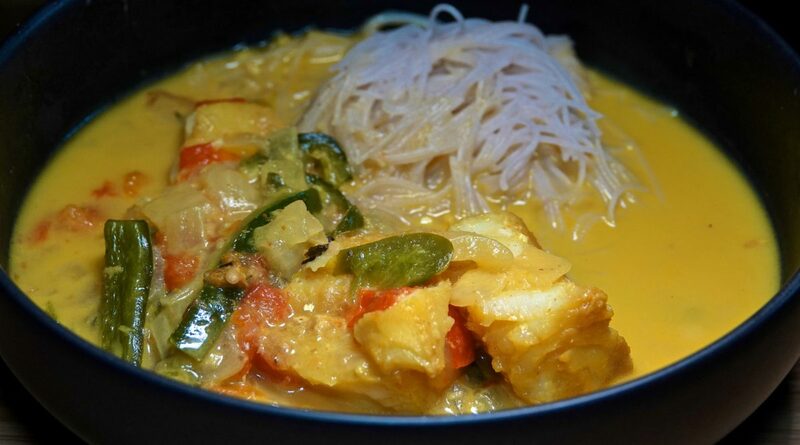 “Fishy Friday” is upon us and tonight we had Coconut Fish Curry with frozen cod. The brown rice vermicelli is $2.39 per pack, and we used half, or 60c per serve. Foodie Philip really enjoyed this curry but Foodie Greg was less enthusiastic. Still a good meal for $4.56 per serve. As we still had half an heirloom tomato that wasn’t going to keep, and chicken we finished baking some rustic rolls and stuffed the tomato and chicken inside. Add 15c for mayo per serve. Not quite as good as a fresh baguette, but still good for $2.29 per serve. With the gas bottle filled we were set to grill tonight’s dry aged rib eye steak. We served it with endive covered with roquamole that had been frozen since we last had guests. 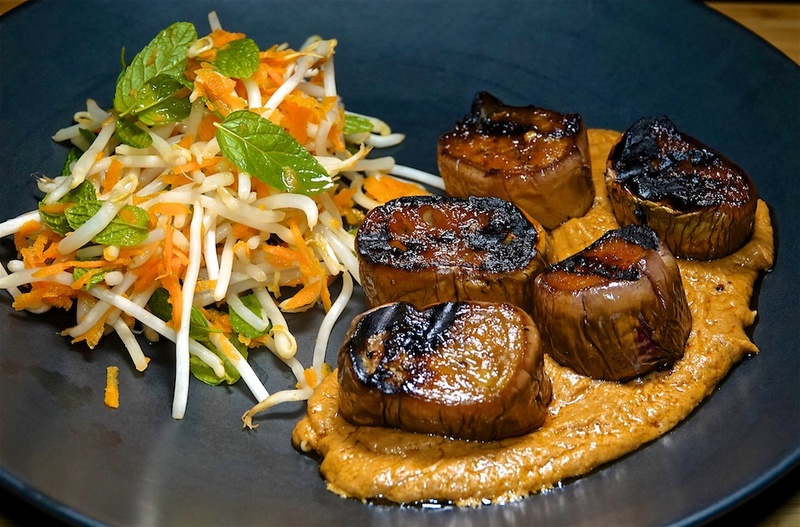 The roquamole & endive is a nod to a similar dish at DOS in Jordaan, Amsterdam. The roquamole is $1.69 per serve. A good meal for $11.14 per serve. The Foodies went on a pilgrimage to Jons and, among other things, got a fresh, warm baguette, a BBQ Chicken and an heirloom tomato. A simple, but great, lunch. A really good sandwich for $2.36 per serve. Tonight was the monthly LACPUG meeting followed by pizza where we contribute $10 per person. Today was the trip back from Denver so lunch was at Denver International where our habit is to eat at the Timberline restaurant. Foodie Philip had the beef tenderloin, while Foodie Greg had the double cut pork chops. I think we’ve been spoiled by our dry aged beef and pork, but neither protein was particularly tender for an average of $39.24 per serve. 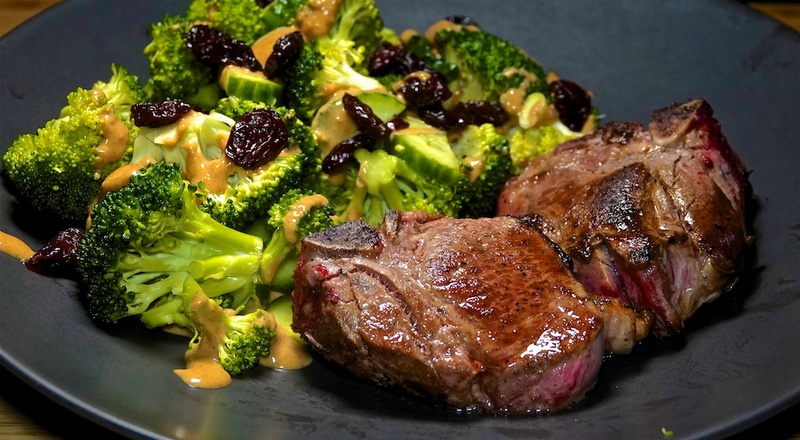 Back home and back to a simple meal of pan seared lamb chops and a broccoli crunch salad. Because the grill was almost out of gas we prepared the lamb chops on the griddle over the induction cooktop. The broccoli salad was good, but not good enough to repeat. 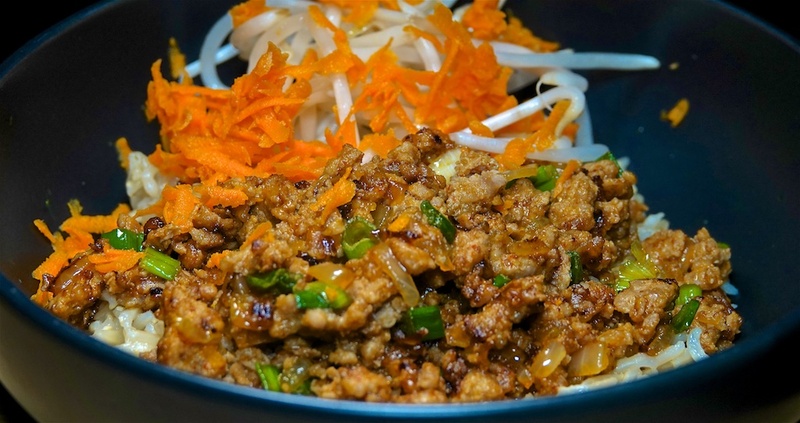 Add 45c for the ingredients in the peanut sauce. A good, but not great, meal for $8.74 per serve. We had very little time between classes at the Colorado Film School that we had to eat fast food! Burger King’s BBQ Bacon Crispy Chicken sandwich filled the spot for $6.26 per serve. Near where we were hosted is a good BBQ joint – Jim and Nick’s BBQ and we chose their Deluxe Combo designed to feed 6-8. The four of us made a credible job, but there was food left over, although not as much as I’d like to think! Our hosts insisted we try the fried green tomato, which we enjoyed. The platter was $19.38 per serve for six serves and the tomato $1.05 each for four serves, for a total of $20.43 per serve. No-one was hungry again that evening! In preparation for our weekend in Keystone we had shopped for some convenience meals, including some Powerbowls. Foodie Philip had a Cuban style pork while Foodie Greg had a Beef and Green bean stew. The bowls were $3.75 each. Back in Denver for the Film School presentation tomorrow, we were fed steamed shrimp with Old Bay seasoning, a garden salad and sourdough bread finished in the oven. We enjoyed it and Foodie Philip certainly enjoyed the shrimp based on the number of shells on his plate at the end of the meal!